Hurry up and order your new brace to start the season in style. THE WAREHOUSE IS FULL & READY FOR THE 2019 SEASON! WHAT IS IT? Works Connection’s Elite throttle tube incorporates all the current throttle technology to produce a frictionless feel when you twist the throttle. WHAT STANDS OUT? Here’s a list of things that stand out with the Works Connection Elite throttle tube. (1) Concept. Works Connection combined the best ideas about throttle tube design into one package. First, there is nothing unique about a CNC-machined 6061-T6 aluminum throttle tube. Every factory bike or high-end project bike uses an aluminum tube for durability. Second, the trend over the last few years is to use one throttle tube combined with an assortment of interchangeable cam pulleys to allow a single aluminum tube to be used on many different machines. This lowers manufacturing costs and is the hallmark of clamp-on grips from ODI, A’ME, Pro Taper, KTM, Moose and Torc1. Third, the Elite throttle tube has a ball bearing mounted internally to lessen drag. Works Connection was able to combine all these existing technologies into a single throttle tube. (2) Interchangeable cams. The snap-on pulley cams allow the Works Connection Elite throttle tube to work on all modern four-strokes. Each cam has a letter molded in it that signifies which model of bike it fits. As a bonus, the system can be moved to your new bike when you sell the old one. (3) Bearing. Installing bearings in a throttle tube to reduce drag is nothing new. Here is an incomplete list of aftermarket throttle tubes with ball-bearing inserts: Oberg (2001), Wirtz Twister (2005), Nue-Tec A.P.E. (2007), Zap Technix (2010) and Pro Taper Twister (2010). The Works Connection Elite throttle tube rides on a sealed, ABEC-1+ rated, radial ball bearing and an internal polymer bushing. The combination of the bearing and bushing allows the throttle tube to ride above the handlebars to create a frictionless feel. Less contact between the two translates into less drag. (4) Installation. The Works Connection throttle tube installs like a traditional throttle tube, but there are a few tricks. If you have handlebars with a larger than normal inner diameter, like Renthal TwinWalls, you need to install the two supplied O-rings to take up the slack. Pay attention to which way the pulley cam snaps on to the throttle housing. It will go on backwards. Make sure that you feel the bearing plug into the end of the handlebars. Don’t misplace the steel end cap on the throttle tube. It keeps grit out of the bearing, but, most important, it stops grip glue from gumming up the bearing. (5) Performance. Hallelujah! It is smoother, turns easier, especially at small incremental movements, snaps back with authority and works with all brands of grips. WHAT’S THE SQUAWK? No issues. Be sure to take time to read the instructions, because making a mistake with your throttle has bigger consequences than putting your underwear on backwards. MXA RATING: We absolutely love the Works Connection Elite throttle tube, thanks to its 6061 tube, radial bearing, Delrin cams and smooth feel. Tusk Impact Wheel Set...Great Value! "This may be the best value in dirt bike parts today! We've been running this Tusk Impact wheel set for nearly three seasons on our YZ and have not had a single problem. They not only work great they still look great. Real value!" The Tusk Impact Complete Wheel is a quality motocross wheel and off-road motorcycle wheel. This motorcycle wheel is made from the best materials and craftsmanship to ensure durability and performance. Pre-assembled and ready to go; includes rim, spokes, hub, bearings, seals, and spacers. Wheel kit includes one complete front wheel and one complete rear wheel. Performance wheel assembly for motocross and off-road racing applications. Pre-assembled wheel is complete with rim, spokes, hub, bearings, seals, and spacers. Anodized rim is constructed from 7050 T-6 aluminum to be the strongest in the market. Hub is forged (not cast) from 6061 T-6 aluminum and CNC machined for precision fit, increased strength, maximum weight savings, and a factory look. Spokes are made from quality 304 stainless steel. Wheel assembly is complete with high-quality sealed bearings, seals, and hard anodized wheel spacers. "The wheels were amazingly good. This is the motocross wheel value of the century." - Motocross Action Magazine. 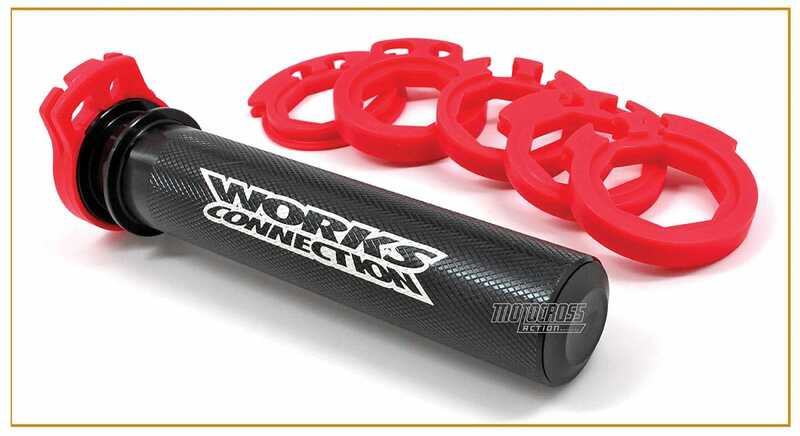 Works Connection is now offering an affordable option for customizing its front brake and clutch caps with your rider number. Now you the have the opportunity to run a professional look like the factory and pro riders do. Just visit worksconnection.com to see how simple and easy it is to get that personalized look for your ride.